Services – Norman J. Mintz, O.D. Dr. Mintz offers comprehensive, informative eye exams, ensuring that all your questions and concerns are answered. 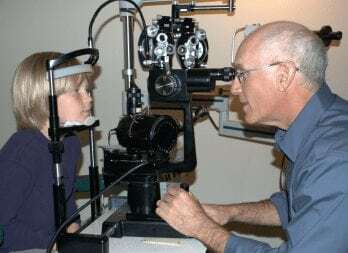 He enjoys the enhanced scope of optometry in treating medical eye conditions as well as correcting focus issues. An exam consists of a refraction (glasses prescription determination); checking for eye muscle balance; cataract; glaucoma; macular degeneration; optic nerve disease; retinal disease; diabetic eye health care; signs of high blood pressure; flashes and floaters; ocular allergy; contact lens evaluation and fitting. Dr. Mintz enjoys working with children, and is sensitive to ease any apprehension. He is equally comfortable examining the aged, and works in area convalescent hospitals. Dr. Mintz has been fitting contact lenses for over 35 years. Not only is he skilled in prescribing lenses with the latest technology for astigmatism and presbyopia, he also has experience in more difficult fitting situations, such as keratoconus. The office keeps an ample stock of contacts in the office, and can get most other lenses in a day or two. Dr. Mintz is certified to provide treatment for eye infections, inflammation, allergies, chronic dry eye and removal of ocular foreign bodies, detection and evaluation of eye diseases such as cataracts, glaucoma and macular degeneration. He has over 30 years experience in the co-management of surgical cases, such as laser vision correction and cataract extraction/intraocular lens implantation. Dr. Mintz offers consultation services for laser surgery to determine whether you are a good candidate for laser vision correction. He co-manages pre and post-op laser surgery, often with Pacific Laser Eye Center in Santa Rosa. Ask for a free consultations to see if LASIK is appropriate for your visual needs and to discuss possible alternatives. PARTIAL LIST OF BRANDS: Available designer glasses includes Guess, RayBan, Tommy Bahama, Eddie Bauer, Anne Klein, Viva, Savvy, Joseph Abboud, Flexon, Revlon, Sigrid Olson, Banana Republic, Gant, Luxottica, Italia Mia, Altair, Catherine Deneuve. Now introducing Hoya, which features a unique rimless line of fashionable eyewear. You can also choose from a selection of retro and vintage eyewear.